DISPOSITIVOS Y SOFTWARE PARA DIAGNÓSTICO Y TRATAMIENTO PARA MEDICINA ALTERNATIVA. MEJOR PRECIO. 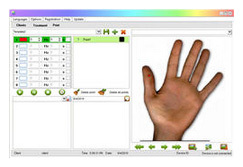 BioPulse Pro - Acupuncture points screening, colour therapy and frequency therapy device. Allows to screen acupuncture points based on Ryodoraku method and promotes body balancing with colour and frequency therapies. 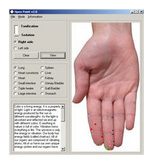 Acupuncture points screening with bluetooth technology and program on your smartphone/tablet. Features of Clients’ tab: It is possible to add a new client or edit or delete information on existing client. With the help of a client’s ID or name, last name, city, phone, date of birth, email you can search for a necessary client within software’s database. A user can add the client's picture in the card. Testing 5 Elements Su-Jok points. Expanded testing of 120 points and shorten 24 points. Inbuilt color therapy functions. Viewing measurement results. 3D images of disbalances in body. 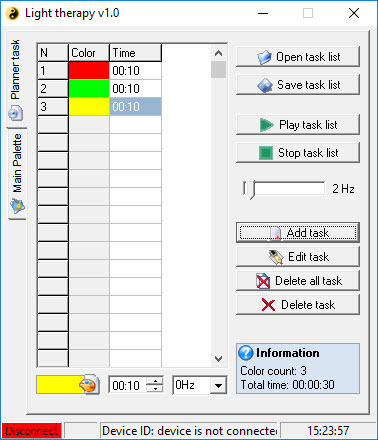 Task scheduler. Enquirer form. Comparison charts. Print out. Recommendations on color therapy, needles, magnets based on test results. Open Point automatical calculation. The software can be supplied with any language. 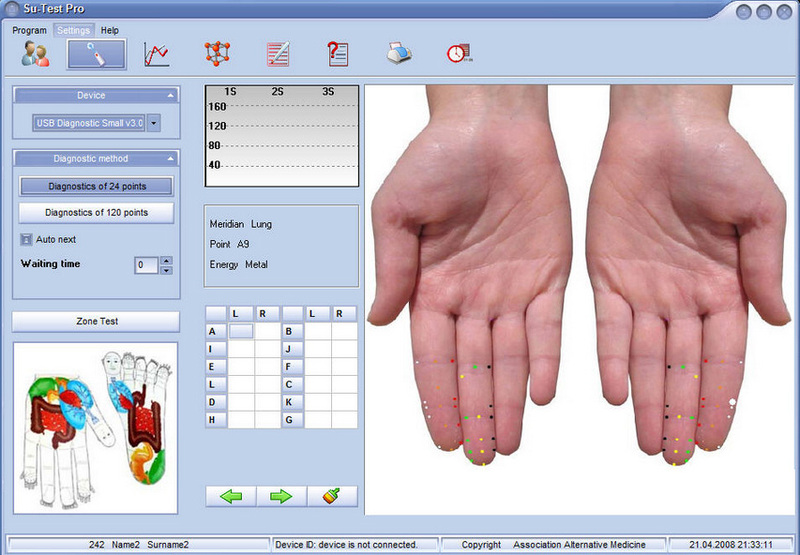 The software TCM PRO – uses traditional acupuncture points for Ryodoraku measurement. Features of Clients’ tab: It is possible to add a new client or edit or delete information on existing client. With the help of a client’s ID or name, last name, city, phone, date of birth, email you can search for a necessary client within software’s database. A user can add the client's picture in the card. 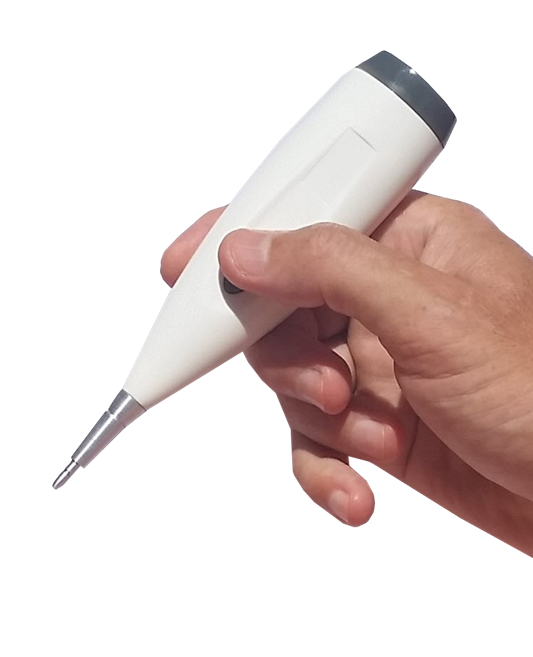 Diagnostic function: Gives an information about tested point (its description, location and indication) The user is able to shift to another point’s testing with time delay, it is possible to set necessary time when the software shifts to another point’s measurement ( may be useful for a beginner). By default the software is set to 3 seconds when it shifts to another point measurement. Charts review: Traditional graph of 12 meridians, left and right sides. Linear diagram to view changes in a span of time. Mark necessary test dates, view and compare how physiological response changed within a period of time. Horary diagram. Manages clients database. Creates personal color therapy schedule. You can describe treatment process. Generates color from 0 to 50 Hz. Viewing treatment made by certain date. The software can be supplied with any language. Sets color generating list. Generates the color from 1 to 30 Hz. Makes Ryodoraku measurements on TCM and Su-Jok points. Displays test results in 4 various charts. 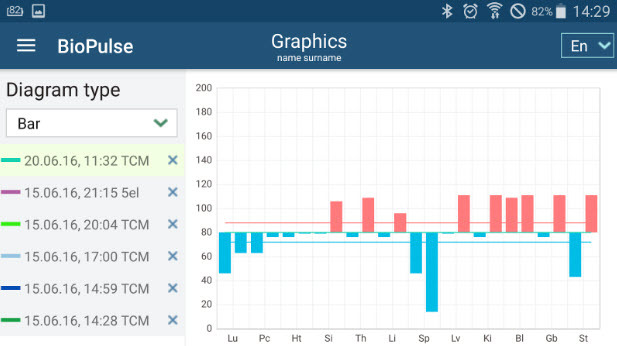 Provides comparison graphs, symptoms, ratios, print out. The software can be supplied with any language. Manages clients database. 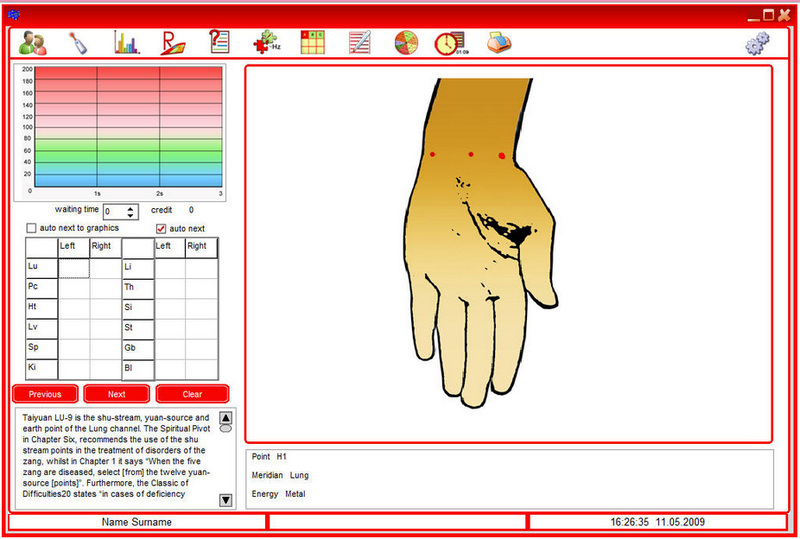 Conducts examination of basic meridian points according to Dr. Voll Remedies test. Inbuilt Vega test function. HEEL hopeopathy remedies base. Comparison charts. Print out. Enables to test, view measurement results, send them to a practitioner by email indicated by you with description of your problems. Supplied for free as an addition to other software package. Manages client database. Creates personal frequency therapy schedules. Sort out frequencies by authors. View treatment protocols history. Print out. The software can be supplied with any language. Manages client database. Enables to add any picture to create own test protocol. Inbuilt color and frequency therapy functions. Viewing treatment results. Comparison charts. Print out. The software can be supplied with any language. Manages client database. Provides points and diseases reference. Inbuilt color and frequency therapy functions. Viewing treatment results. Comparison charts. Print out. The software can be supplied with any language. Manages client database. Testing 5 Elements and 6KI Su-Jok points. Inbuilt color therapy functions. Comparison charts. Print out. Manages client database. 3D points display. Possibility to move closer to points and turn hands for their better viewing. Reviewing measurement graphs. The software can be supplied with any language. Automatical calculation of Open Point for Su-Jok method. Displays points for color, magnets and needles. Works independently from the device. APP program Biopulse Ryodoraku and Medical Frequency Program.